It would be interesting to hear the @TfL justification for taking pavement space not road space. Promoting cycling should be at the expense of cars not pedestrians. Stupid planning. Needs a thorough look. I find cycling along the High Road is OK. Need to consider impact on pedestrians. No you reduce traffic by reducing roadspace allocated to motor vehicles. Conversely increasing space induces more motor traffic. I'm afraid 'done properly' 'sufficient space' are a sort of refuge. 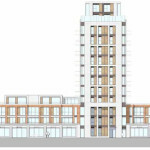 Have you seen what's proposed for Chiswick High Road? Inherent conflict.